A funny thing happened in November of 2012. A quirky comic book title centering on an oft-overlooked mutant character was born. David Haller, otherwise known as Professor Xavier’s mentally unstable son, Legion, would be headlining Si Spurrier’s relaunch of X-Men Legacy. Oh, there were naysayers and readers who quizzically cocked their heads in confusion that such a book was being ushered out with Marvel’s first wave of “NOW!” titles. Unfortunately, I have to count myself among their ranks. How on 616’s earth would a character like Legion be able to sustain an ongoing title in such a capacity that readers would continue to pick up the latest issue each month? What we weren’t prepared for was the odd and imaginative literary magic that Spurrier would weave into the pages of Legacy. A very devoted and vocal fan following developed and the book would become, consistently, one of the best written X-books each month. To bring foolish non-readers up to speed, X-Men Legacy finds Legion dealing with the fallout of his father’s death during AvX and trying to figure out his own place in the grand scheme of the fledgling mutant race. With a “legion” of multiple personalities that inhabit his fractured psyche (each with their own mutant ability), David decides on a more direct approach to dealing with mutant threats… he intends to preemptively cut them off at the pass before any damage can be done. His machinations do not go unnoticed by mutant precog, Ruth Aldine (a.k.a. Blindfold). These two outcasts soon find themselves inexplicably drawn to eachother and are soon as inseparable as Sid and Nancy. One of the interesting aspects of the book is that the story alternates between events happening on the physical plane and those occurring within Legion’s gray matter. By delving into the trappings of Legion’s mind, readers are not only treated to a first-hand account of David’s internal thought process, but we also have the opportunity to witness the chaos of having a near-infinite cavalry of sometimes very dangerous personalities running amuck in his head. Fans of continuity references and tertiary characters have, arguably, made up a good portion of Legacy‘s fan base and with good reason. 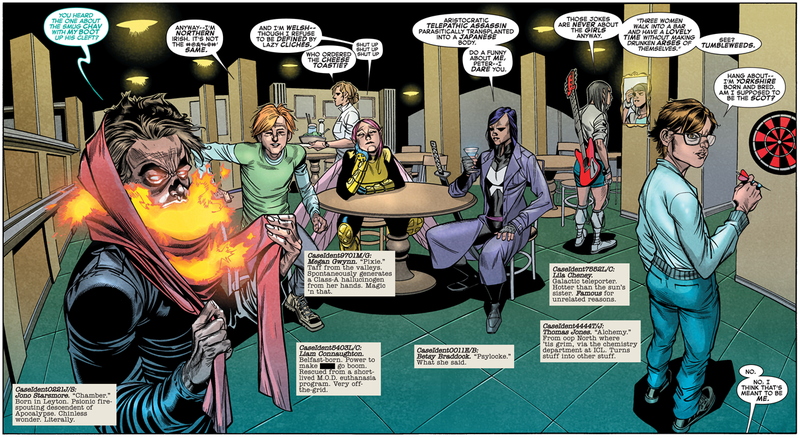 Past events like Inferno were referenced and obscure characters (Ruckus of the Nasty Boys, Lila Cheney, Pete Wisdom, Meggan, Liam Connaughton, and Alchemy) were dug out of Marvel’s bottomless bin of forgotten mutants. Spurrier also used the past year to tie up the loose end regarding Blindfold’s brother who was briefly but ominously mentioned by Destiny towards the end of Necrosha. In addition, we finally get closure (albeit, heartbreaking) between Legion and his estranged mother, Gabrielle. The X-books, Legacy included, and mutant characters in general have always been seen as a metaphor for any persecuted minority in real life. Gay and lesbian fans of comic books have often gravitated to Marvel’s merry mutants for this very reason. 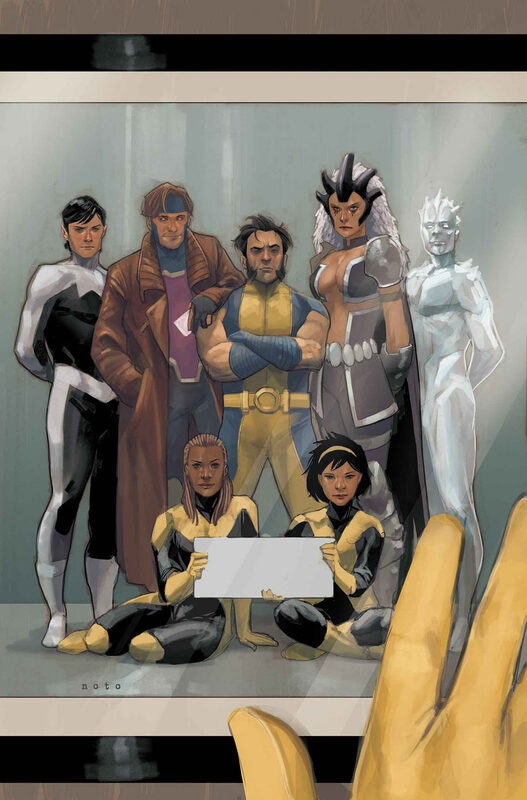 From reparative therapy clinics and virulent anti-mutant protests, Legacy‘s references to some of the daily vitriol that many members of the LGBT community still face was crystal clear. As we have learned from Marvel’s January 2014 solicitations, nothing this great lasts forever. The start of the new year will, unfortunately, see the series “race towards its conclusion.” I don’t doubt that the climax of this book will be as enjoyable as the story thus far. One of the few saving graces is that Si Spurrier and amazing cover artist, Mike Del Mundo, will be allocated to other Marvel titles. If you have been a reader of any countless X-books in the past but have avoided this title due to a lack of “a-list” characters or immediate ties to the various mediocre crossover events that we’ve been subjected to in the last year, I suggest digging through your store’s long boxes, dropping a couple of bucks on the back issues, and settling in for quite a fantastic ride. Fearless: A Requiem for the Defenders. In February of 2013, if you were to tell me that my favorite book of this year would be mainly comprised of C and D-List superheroines and villainesses, would I have believed you? Yes. Yes, I would. If you’ve had the opportunity to speak with me about my love of comic books for at least five minutes, you would quickly find out that my unwavering love for underused and underutilized female characters knows no bounds. For those of you not in the know (yes, I hold you all mostly responsible for the book’s cancellation), Fearless Defenders spun out of the events of Fear Itself: The Fearless, arguably the only good tie-in associated with the Fear Itself crossover event. The first issue hit store shelves just prior to Emerald City Comic Con in Seattle which, coincidentally, would be the first time that I had the priviledge of meeting the book’s scribe, Cullen Bunn. His excitement about the new book was palpable. I remember discussing Misty Knight with him and stating that she doesn’t get the love she deserves even though she’s pretty much Pam Grier’s Foxy Brown with a robot arm! The book brought together a ragtag group of female superheroes to battle the love child of Doctor Doom and Morgan Le Fay as she and her army of Doom Maidens attempt to usher in world-wide destruction. 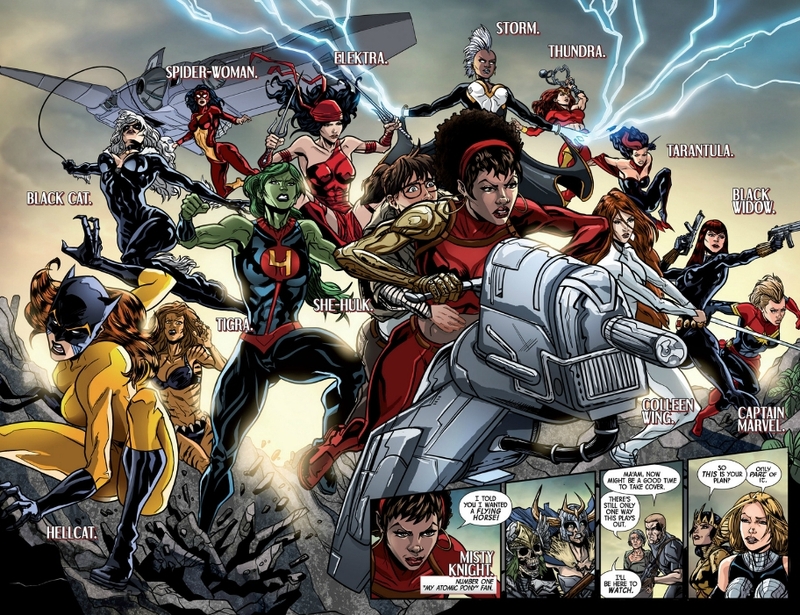 The team leadership role was split between Brunnhilde (Valkyrie) and Misty Knight. 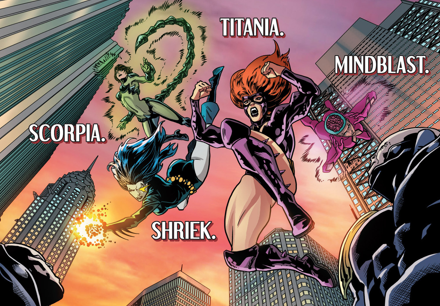 As the story progressed, the team’s ranks would expand to include a bookish archaeologist (Annabelle Riggs), a resurrected Amazonian warrior (Hippolyta) a depowered mutant (Danielle Moonstar), a snarky British monster hunter (Elsa Bloodstone), an exiled sorceress (Clea), and a newly activated Inhuman (Ren Kimura). Even with such a large and diverse cast, Bunn had no problems adding to each character’s development within the story and giving each lady her own, distinct voice. Caroline Le Fay’s team of Doom Maidens was also made up of a veritable who’s who of “where the hell have they been?” villainesses… Ruby Thursday. Quicksand. Sylvie Lushton (The Enchantress). Titania. Scorpia. Mindblast. Shriek. When a creator pulls characters like this out of “comic book limbo”, it’s pretty safe to say that it has more to do with his/her affinity for the character and less to do with editorial mandate. 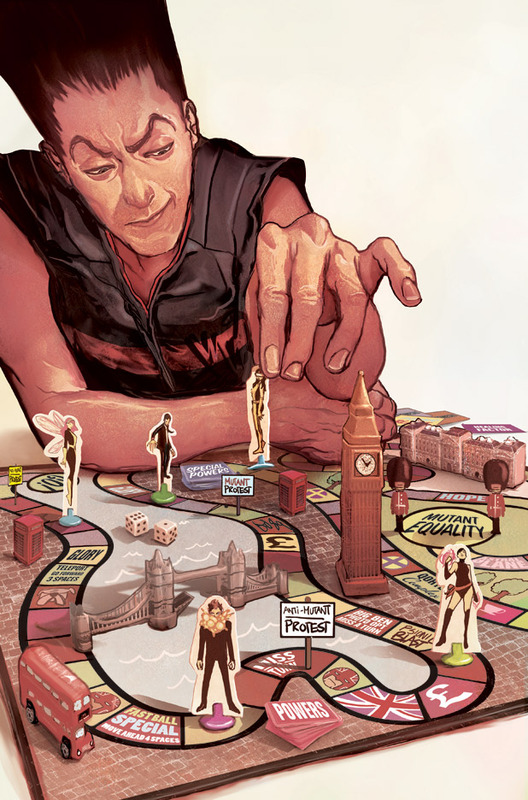 Will Sliney handled the pencilling for the series (save for issue #7 in which Stephanie Hans took the helm for Clea’s return). To say that his work was consistently enjoyable would be an understatement. His characters’ facial expressions were crisp and clearly demonstrated the appropriate emotion required for the panel (the pseudo-condescending looks and side-eye that Elsa would throw Misty were some of the most memorable). During some of the epic smackdowns and battle scenes, characters were never lost due to murky artwork which is more than some other artists on the top-tier books can boast. Sliney’s pencils, coupled with both beautiful coloring from Veronica Gandini and Mark Brook’s absolutely stunning covers, made for some unforgettable visuals. If we have learned anything from Marvel Comics over the years, it’s that nothing this good ever lasts forever (read: Greg Pak and Fred Van Lente’s Alpha Flight reboot, Jeff Parker’s Agents of Atlas and Atlas) It’s easy for folks to say that books that lack an A-list character like Captain America or Iron Man will never make it. I don’t necessarily believe that to be true. Books featuring these characters are going to sell, regardless, and yet they are the titles that generally receive the most promotion and the heaviest push from Marvel. It’s well beyond time that publishers give the underdogs a bit more of a boost instead of leaving them to tread water until they’ve become exhausted around issue #12. The fans and creative teams of these books deserve better. While the fanbase of Fearless Defenders may not be as large as that which reads any one of the sixty Wolverine-centric titles that Marvel pushes out on a monthly basis, I can safely say that we are a dedicated and vocal fanbase. Perhaps my memory deceives me, but I don’t recall seeing any Savage Wolverine readers organizing a cosplay photo shoot based on the book at this year’s NYCC. Fearless Defenders was one of those rare gems that my eyeballs eagerly gobbled up each month on the day it was released. It represented both female and queer characters in not only a positive but also a powerful light. Saying it will be greatly missed just doesn’t seem appropriate enough of a sentiment. X-Men: Now A Little Less Astonishing. The most-talked-about superhero wedding of the decade. Sibling rivalry at its worst. A heartbreaking tale of an alien artist. A world shrouded in ice and on the brink of an apocalypse. These were a few of the memorable moments that Marjorie Liu has shared with us during her all-too-brief tenure on Astonishing X-Men. What made this book so special in a myriad of comics on the shelf featuring Marvel’s band of mutants? If comic book readers have learned anything over the past few years, it is that there will never be a shortage of mediocre stories featuring brawls between A-List superhero teams or Wolverine SNIKTing everyone and everything in every title (because, let’s face it, he really IS in every title). Once in a while, though, we are treated to a rare gem that doesn’t rely on a “This changes the Marvel universe forever!” gimmick. If you haven’t been following Marjorie Liu’s run on the Astonishing title, then you’ve left that rare gem buried in the sand. I have always been a proponent of stories that rely heavily on character development. A story is only as strong as the characters presented in the pages. 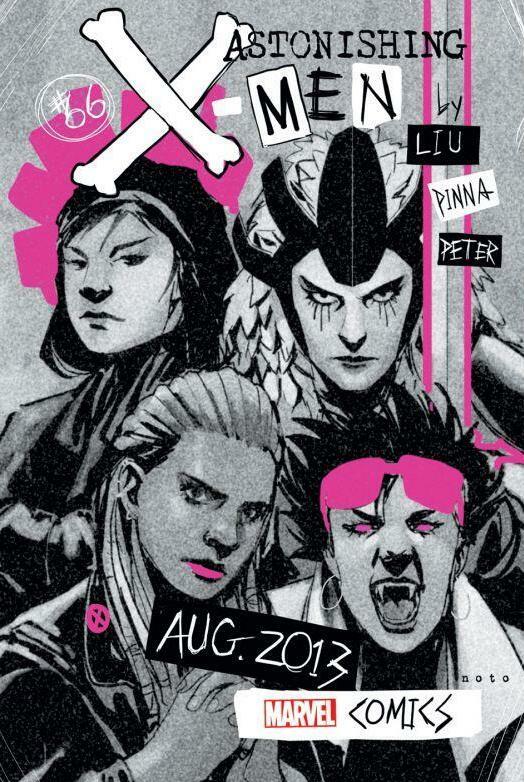 Looking at her previous work with Marvel (NYX:No Way Home and the X-23 solo series), it should not have come as a surprise to readers that Ms. Liu was going to waste no time in digging through the fluff and getting down to the emotional core of her ragtag band of X-Men. Whether it be societal prejudices (Northstar and Kyle), familial ties and the trauma of abandonment (Karma and Susan Hatchi), a flirtatious friendship and budding romance (Gambit and Cecelia Reyes), a search for oneself (Warbird), or even the reflection on failed past relationships (Iceman), Astonishing has dealt with an entire airport of baggage that life throws out on a daily basis. 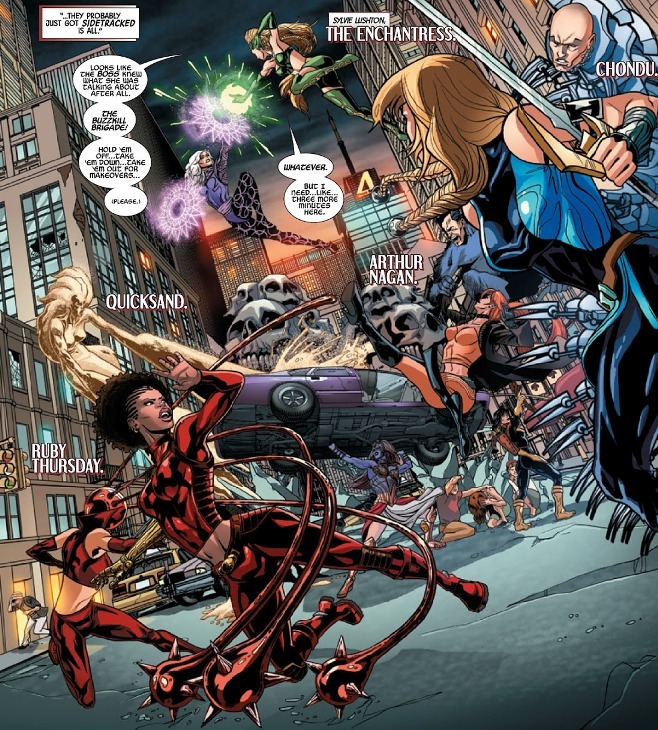 An extra dimension was given to these characters which showed readers that they aren’t just swinging fists used to clobber eachother in a battle royale for the fate of the world. They become relatable and empathetic. This is not to say that Liu’s run on Astonishing did not have its fair share of knock-em-down, drag-em-out moments. We witnessed Bobby Drake bring about a modern day glacial age that made the Blizzard of ’77 look like a few passing flurries. It doesn’t get more action packed than that. Liu is just constantly aware that if these characters are put in mortal danger, the reader needs to first care about them. That hearkens back to the importance of developing a character and giving the audience a reason to concern themselves with the well-being of said character. After the series concludes with issue #68, I will truly miss having Astonishing X-Men as part of my monthly pull list. Marjorie Liu’s knowledge of continuity and passion for the characters coupled with stunning art from the likes of Mike Perkins, Gabriel Hernandez Walta, and Phil Noto all made for something very special that I will undoubtedly revisit time and time again.